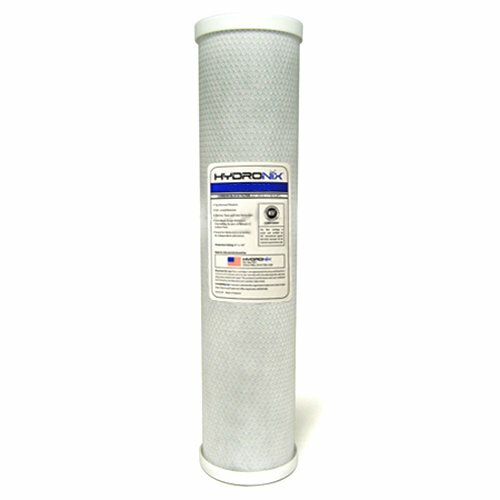 Save 1% on the Hydronix CB-45-2005 NSF Carbon Block Filter 4.5'' OD X 20'' Length, 5 Micron by Hydronix at Friv 4 Friv . MPN: HYDRONIX-CB-45-2005. Hurry! Limited time offer. Offer valid only while supplies last. This Hydronix CB-45-2005 carbon block filter has a particle retention size of 5 micron, and is suitable for drinking water filtration applications. This Hydronix CB-45-2005 carbon block filter has a particle retention size of 5 micron, and is suitable for drinking water filtration applications. It has coconut shell activated carbon filter media to reduce unpleasant taste and odor from drinking water. This filter has a 4.5" outside diameter (OD) and an overall length of 20". It has an operating temperature range of 40 to 180 degrees F, and a maximum pressure rating of 250 pounds per square inch (psi). This carbon block filter is certified by the National Sanitation Foundation (NSF) Standard 42 for material requirements only, and is suitable for use in water dispensing applications where higher chlorine levels are present. Hydronix Water Technology is a supplier of water filtration, purification and separation products. The company, founded in 2010, is headquartered in Chino Hills, CA. 4.5" OD and an overall length of 20"
If you have any questions about this product by Hydronix, contact us by completing and submitting the form below. If you are looking for a specif part number, please include it with your message.